Sometimes I forget that I actually like blue cheese. Or at least some blue cheese. Ever since I made Pear Chutney Bruschetta with Pecans and Gorgonzola so long ago, I’ve become much more likely to make a dish that calls for blue cheese. Before, I would substitute feta which isn’t even close to the same flavor. But even though I’ve come a long way, I still eat ranch with my buffalo wings and substitute gorgonzola for real blue cheese. A tiger can’t change it’s stripes. 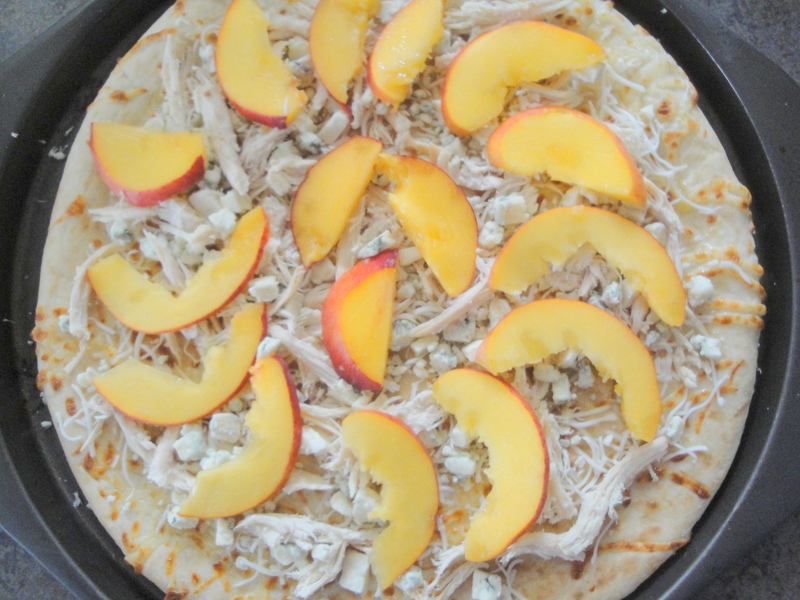 This Peach and Gorgonzola Chicken Pizza is a good way for someone to baby step their way into the world of blue cheese. 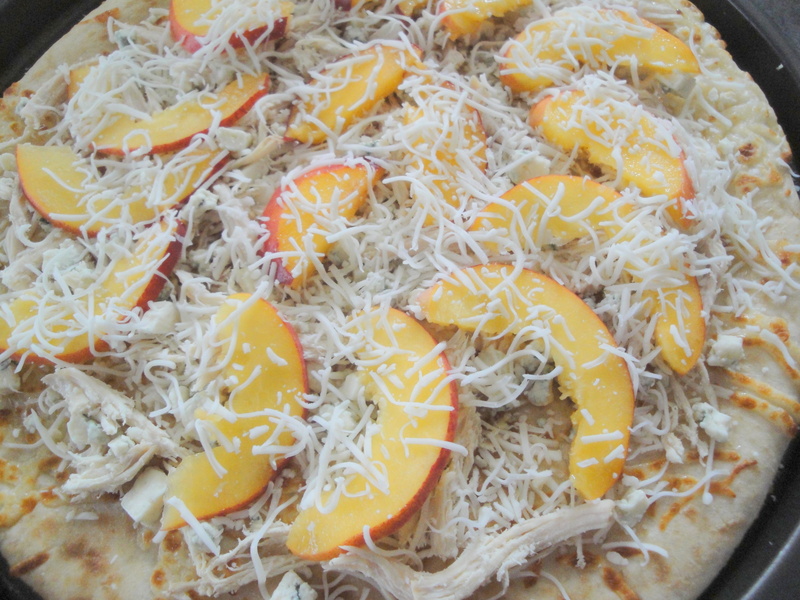 Prebaked pizza crust is topped with sliced fresh peaches, crumbled gorgonzola cheese, shredded chicken, and mozzarella cheese. After baking, a reduction of balsamic vinegar is drizzled over the top to add yet another bold taste which enhances the whole pie. 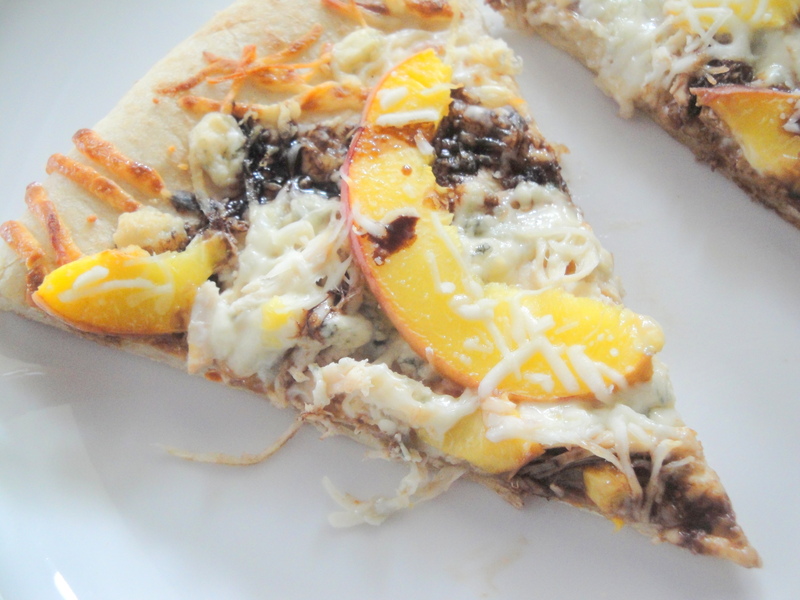 The sweetness of the peaches, the bite of the gorgonzola, and the tang of the balsamic vinegar all make for a perfect marriage of unique pizza flavors. 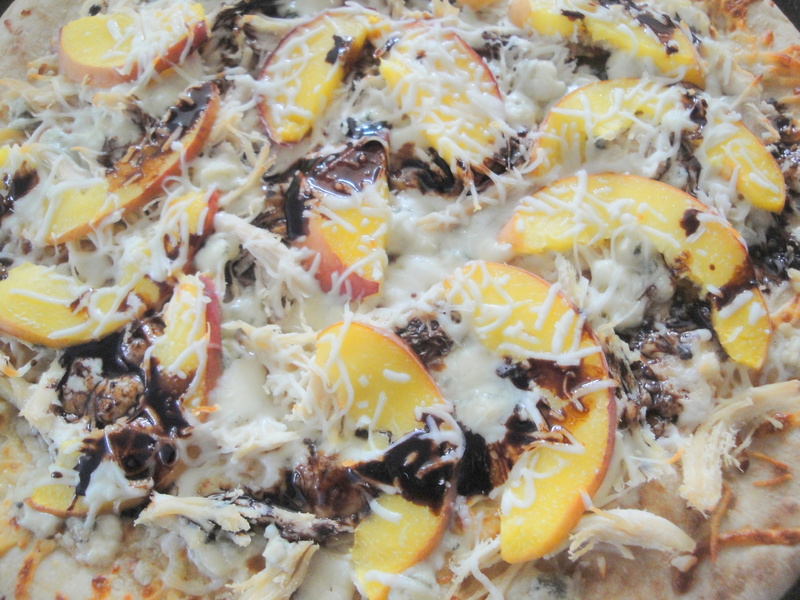 With nary a tomato in sight, this isn’t your typical pizza. But it’s ease and amazing combination of flavors makes for a quick week night dinner that’s perfect for a warm summer night. If you like this, also check out Apple, Ricotta Cheese, and Pecan Pizza. 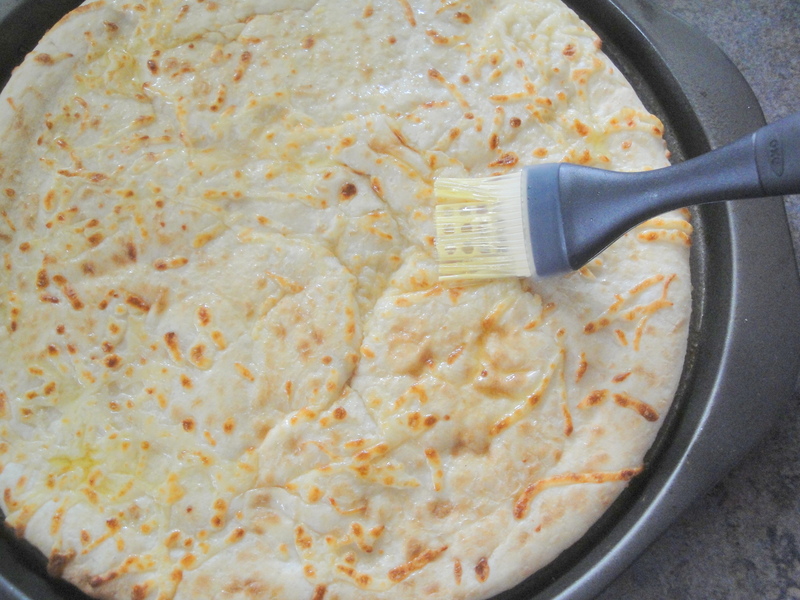 Place pizza crust on a baking sheet coated with cooking spray. Brush 1 teaspoon extra-virgin olive oil evenly over crust. 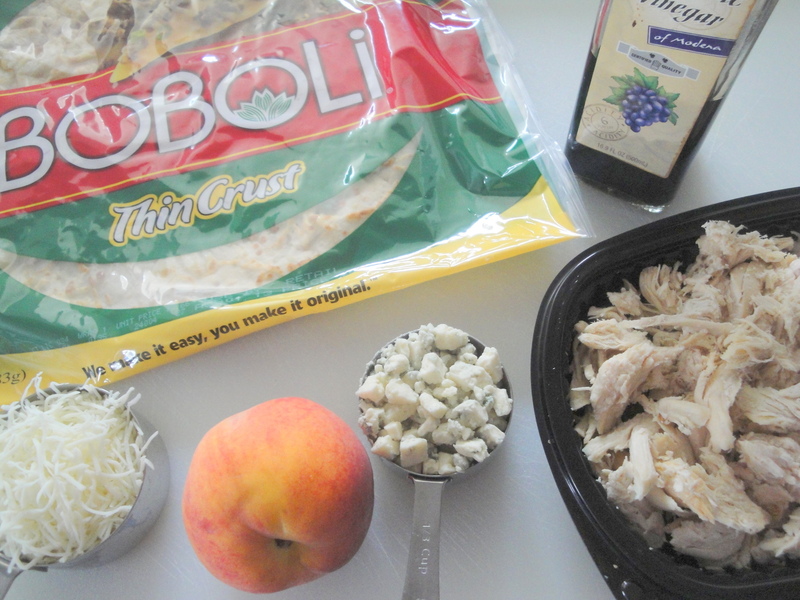 Top evenly with 1/4 cup shredded mozzarella cheese, chicken, Gorgonzola cheese, and peach slices. Top with remaining 1/4 cup mozzarella. Bake in a preheated 400°F oven for 11 minutes or until crust browns. 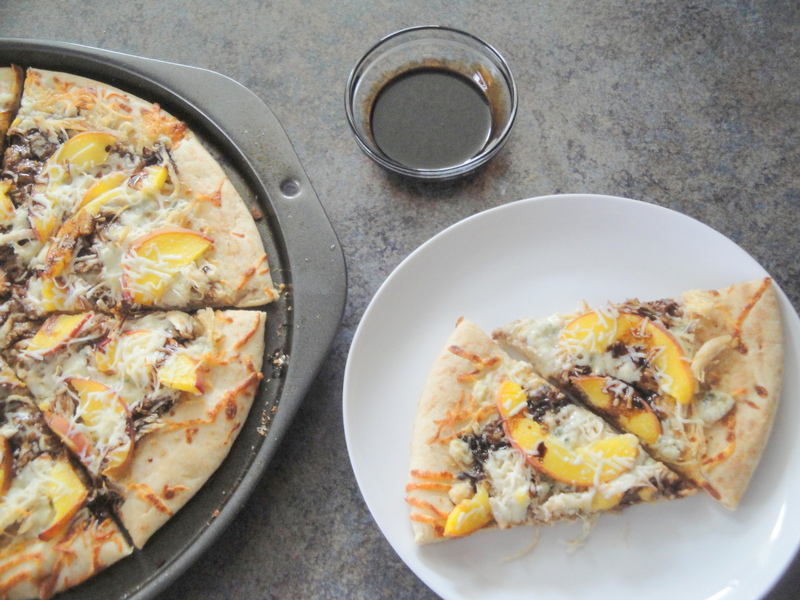 Drizzle balsamic reduction evenly over pizza. Cut pizza into 8 wedges. 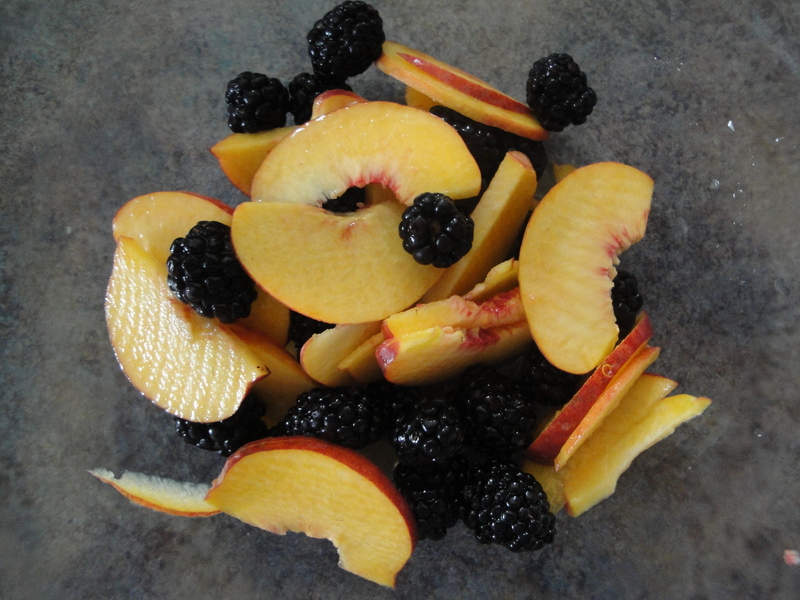 Have you had blackberries or peaches yet this summer? I hope so! Have you baked them with some brown sugar and oats? Do that next! For someone like me who has a very prominent sweet tooth, it’s important that I find desserts that satisfy those cravings without making me feel rotten afterward. 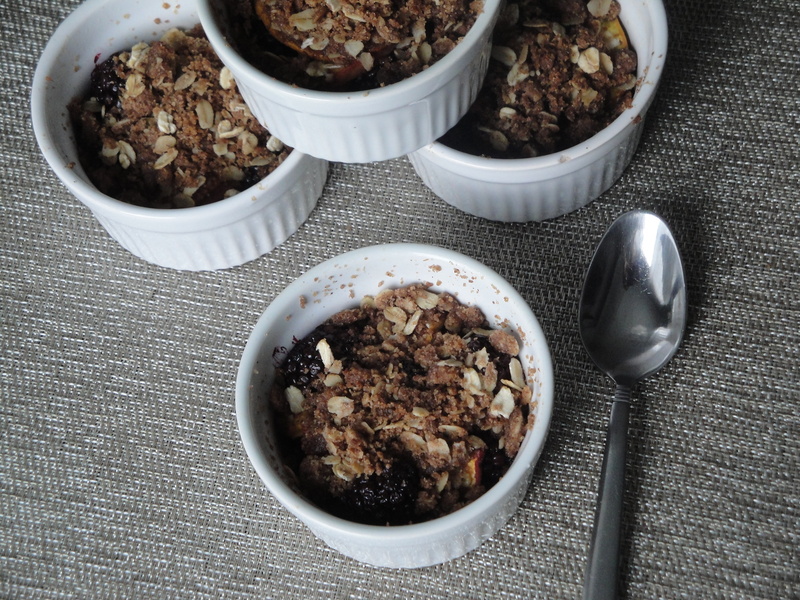 My mom used to make apple crisp all the time when I was younger and, as a result, I love a good fruit crisp – especially the “crisp” part. I mean, flour, sugar, oatmeal, butter, how can you go wrong? 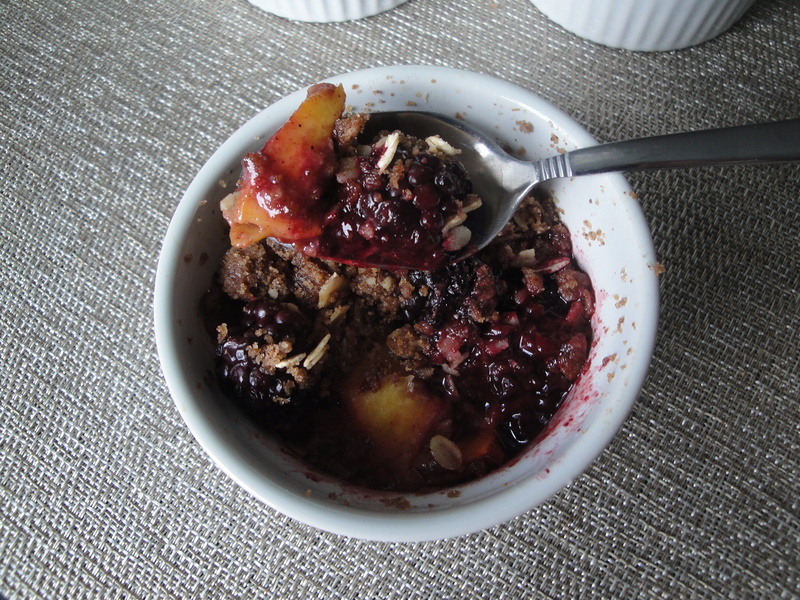 When I came across this recipe for Blackberry-Peach Crisp, I was a little worried that the topping wouldn’t be as sweet and decadent tasting as the good old-fashioned crisps of days past but this dessert did not disappoint. 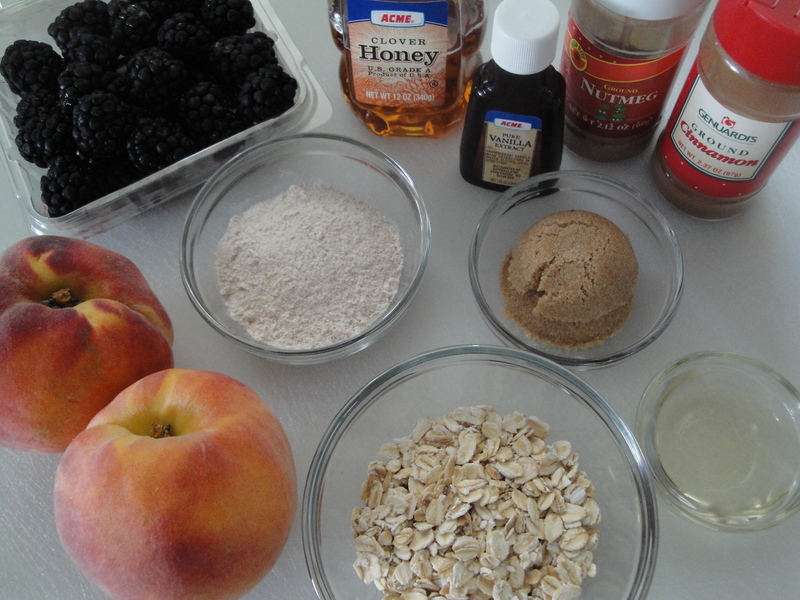 Fresh blackberries and peaches are mixed with nothing more than fresh orange juice (I used clementine juice!) and vanilla, allowing their natural sweetness to shine through. 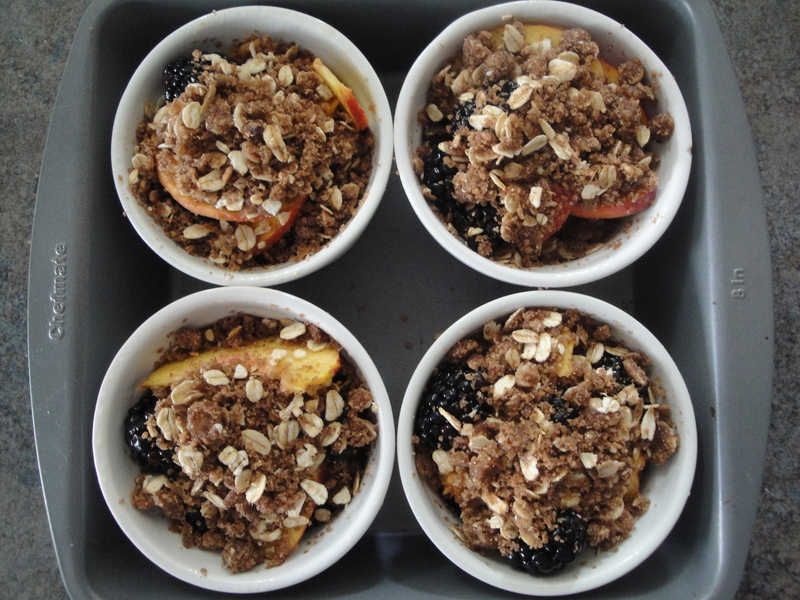 The fruit mixture is placed in individual ramekins and topped with a gooey coating of whole-wheat flour, oats, brown sugar, canola oil, and honey which melts together to form a crunchy topping. 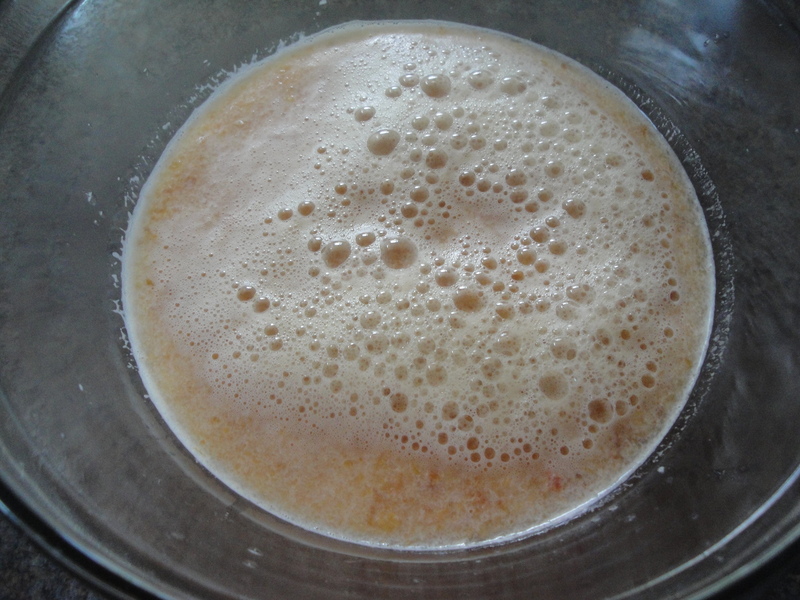 The fruit gets perfectly soft and bubbly as it cooks and is delightfully mildly sweet. 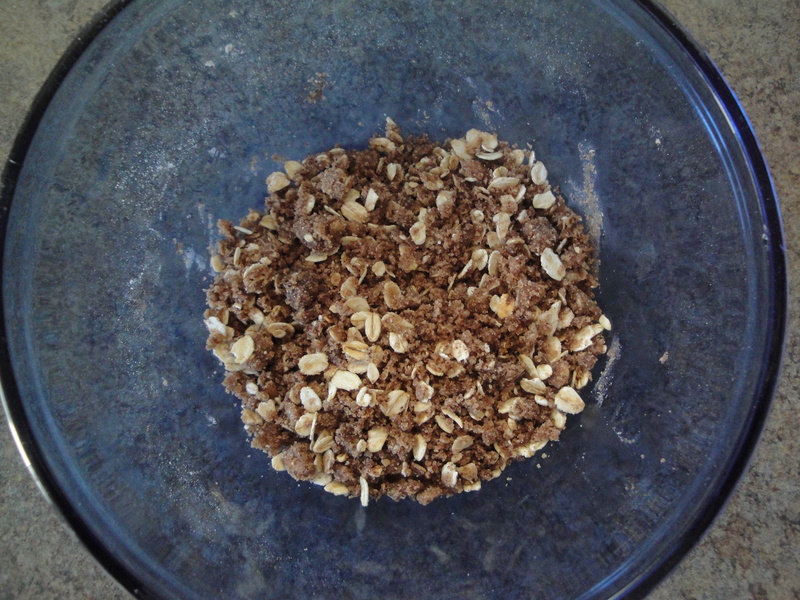 This crumb mixture, which is spiced up with cinnamon and nutmeg, isn’t loaded with flour, thank goodness, but instead has a consistancy closer to granola which makes my toes curl. 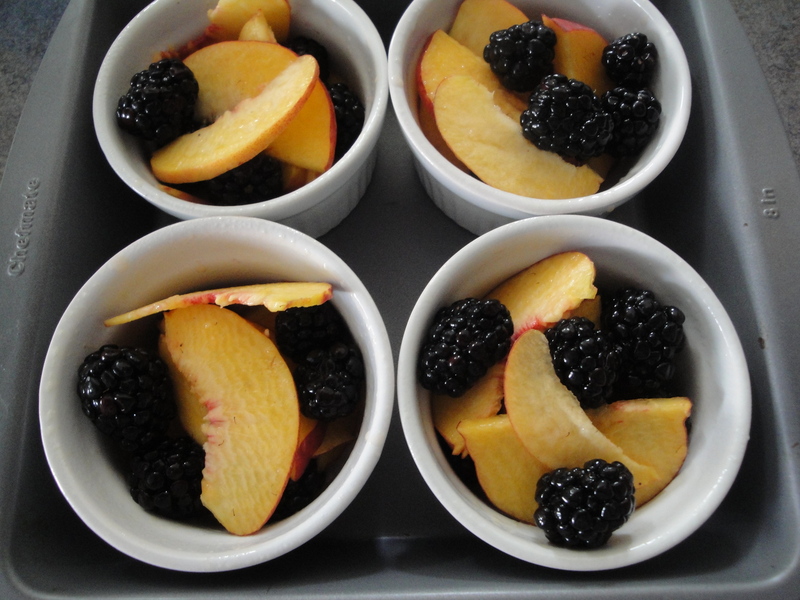 And because this dessert is baked in ramekins, portion control is easy to maintain (only 159 calories a serving!). I could easily make a batch of this crumb topping and eat it with nothing but a spoon and a smile. And maybe some ice cream. I’ll keep this recipe close by to use later in the fall with apples and pears. My mouth waters just thinking about it. 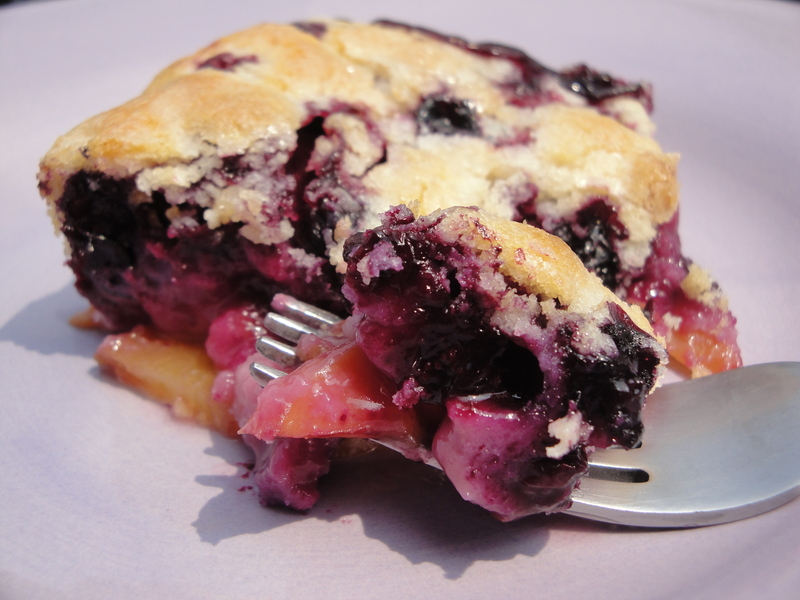 If you like this, also check out Blueberry-Peach Cobbler. 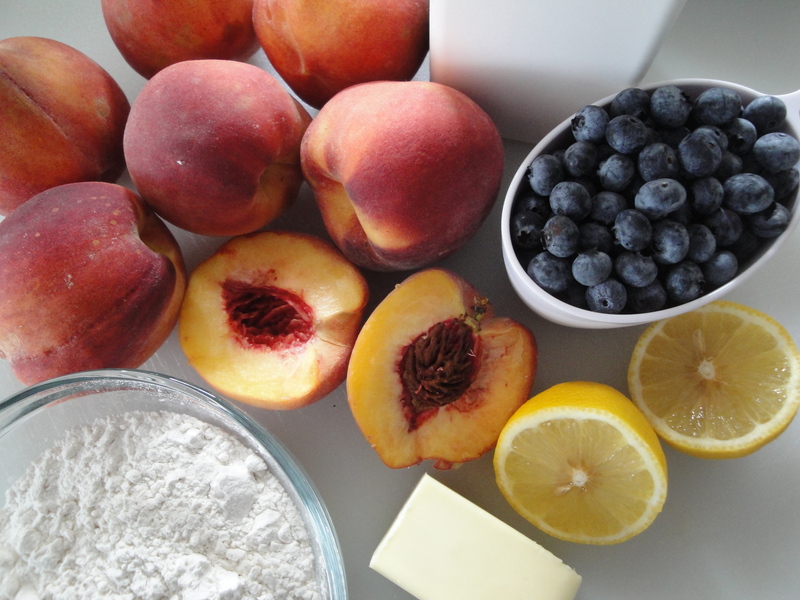 Combine berries, peaches, juice and vanilla in a bowl and mix well. In a separate bowl, combine whole-wheat flour, oats, brown sugar, canola oil, honey, cinnamon and nutmeg with hands until moist and crumbly. Spoon fruit mixture into four 4-oz ramekins coated with cooking spray. Scatter crumb mixture evenly over the top of each. Bake in a 375°F oven for 15 to 20 minutes or until fruit bubbles and top is golden brown. I took the day off yesterday and after going to the dentist in the morning, I spent the rest of the day reading and lounging around (a mental health day). It felt wonderful. The problem with me having time to myself is I come up with all of these crazy ideas of things to do that I spend a lot of time thinking about but never actually end up doing. Like writing a novel or traveling across the country – both things that I plan to do one day, even if I’m old and gray when I do it. 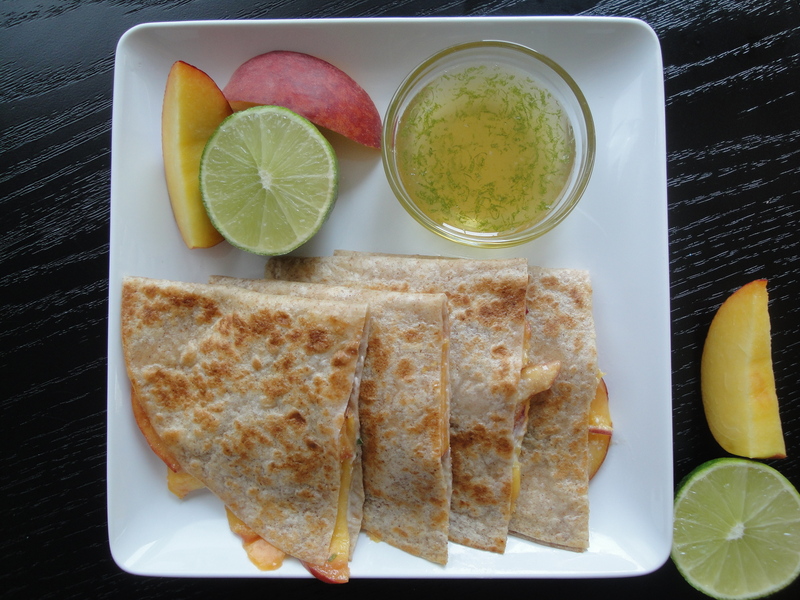 In all of my reading and daydreaming, I paused to make myself a delightfully light summer lunch: Peach and Brie Quesadillas with Lime-Honey Dipping Sauce. 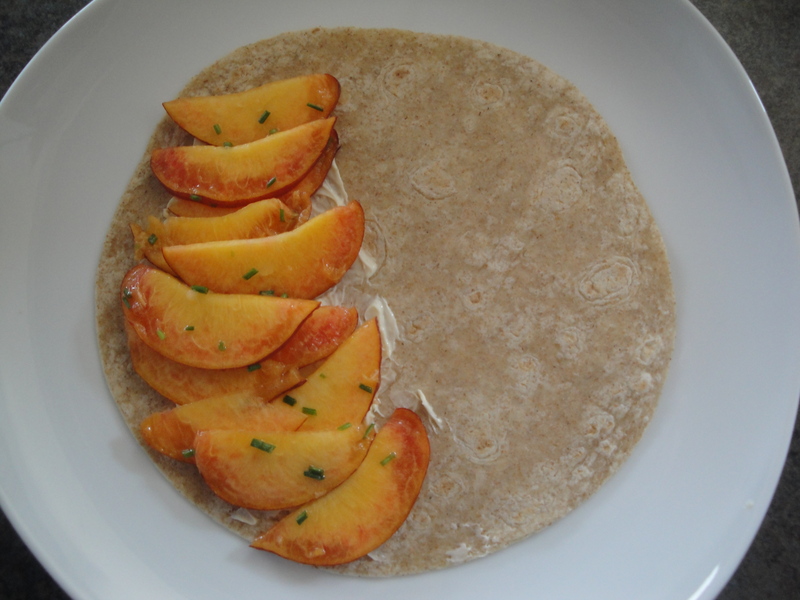 Thin slices of peaches are tossed with a touch of brown sugar and chopped chives before being folded into a tortilla with soft Brie cheese and toasted. 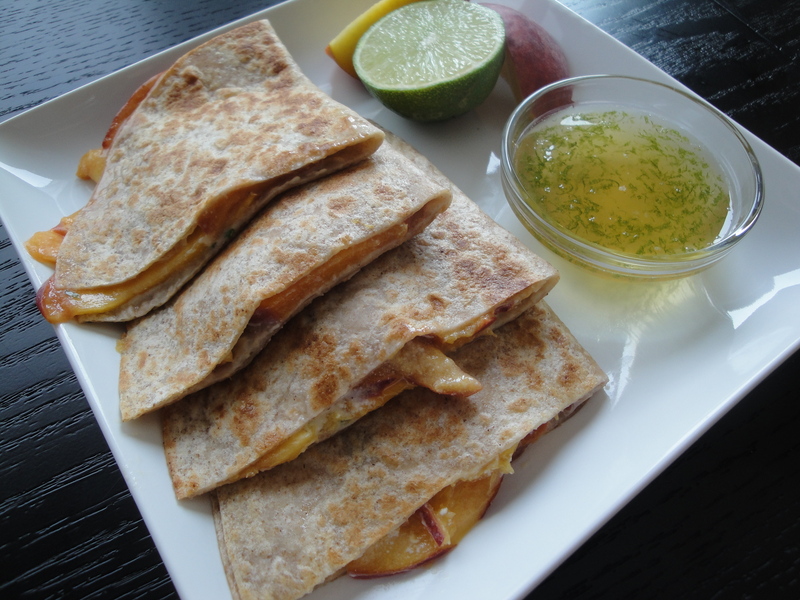 The buttery, nuttiness of the Brie complements the natural sweetness in the peaches making them a perfect pair and the slight onion flavor of the chives gives this quesadilla an overall savory bite. I like the idea of using these ingredients in a panini or grilled cheese so go crazy and make this however you want. The dipping sauce is a simple mixture of lime zest, lime juice and honey tops off each bite with a bright, sweet ending. All of these flavors are terrific together. 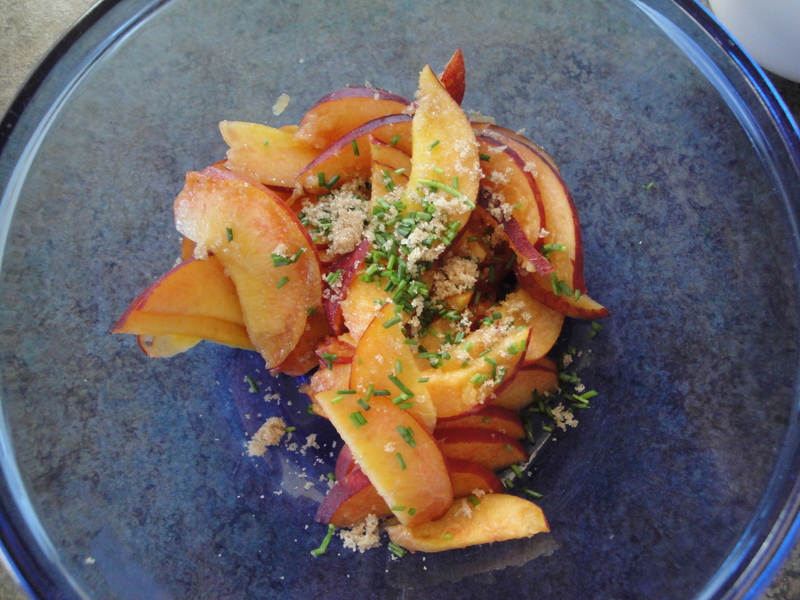 Combine peach slices, chives and brown sugar in a bowl, tossing gently to coat. 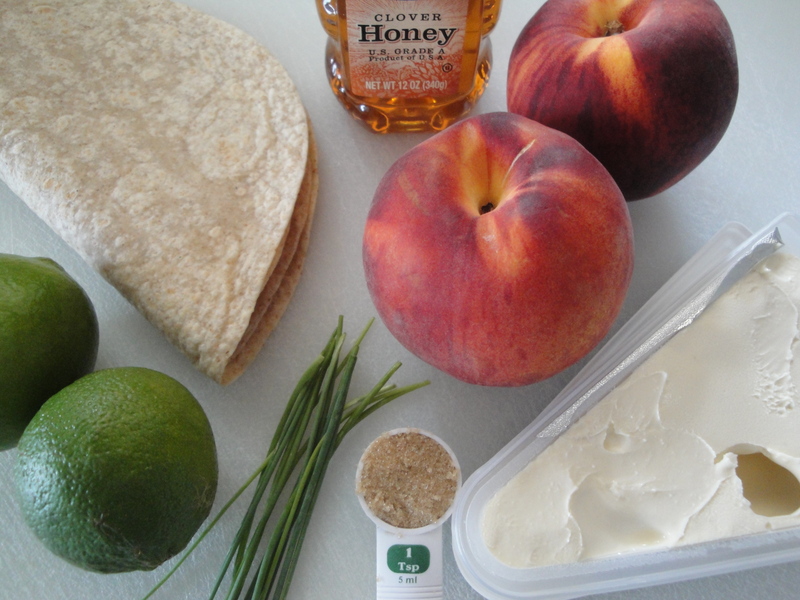 Spread Brie over half of one tortilla and top with peach mixture. Fold in half and repeat with other tortillas. Spray a large nonstick skillet with cooking spray, heated over medium-high heat. 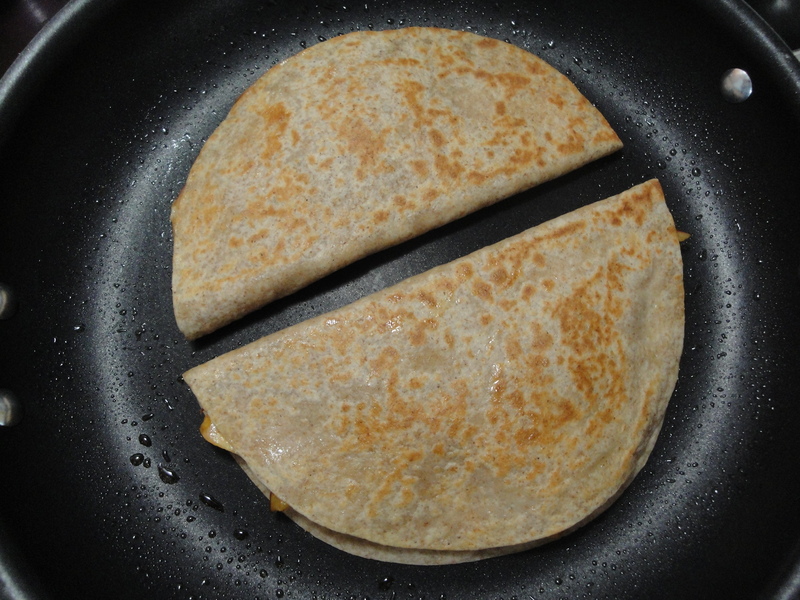 Place folded quesadillas in the pan and cook 2 minutes on each side or until tortillas are lightly browned and crisp. 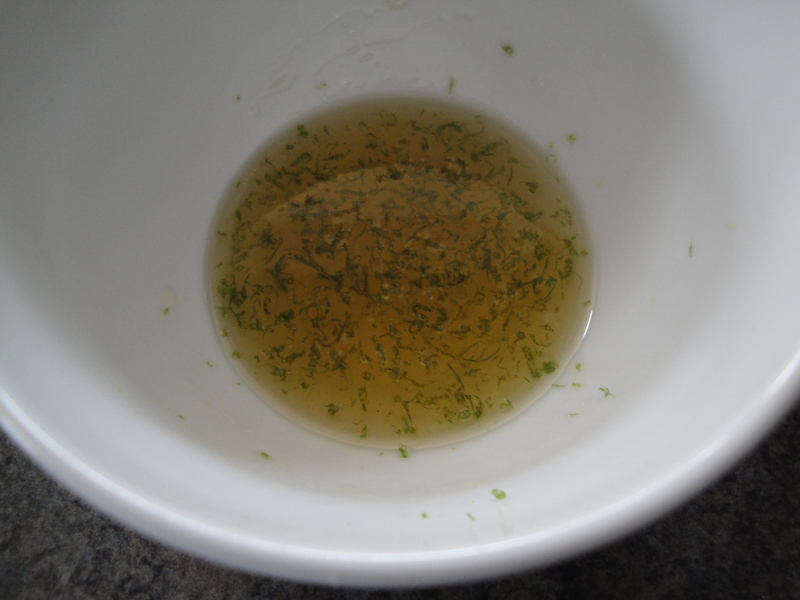 In a small bowl, combine honey, lime zest and lime juice with a whisk and set aside. Cut each quesadilla into wedges and serve with sauce. Yes, I know it is soooooooo super-easy to keep a container of Crystal Light or Country Time in your cabinet, put a scoop in a pitcher with some water and pour yourself a glass of lemonade in a few short minutes. But let’s be honest, lemonade mix doesn’t hold a candle to an ice-cold lemonade made from freshly squeezed lemons, does it? This homemade lemonade, Peach Lemonade, might take a little longer than lemonade from a mix but it’s so much better. 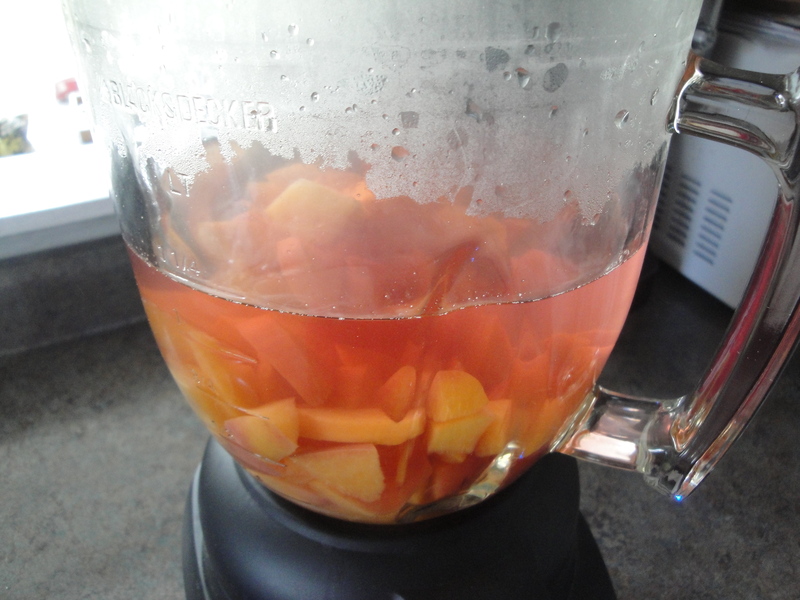 And on a nice spring day, fresh peaches and freshly squeezed lemonade are a perfect little marriage. 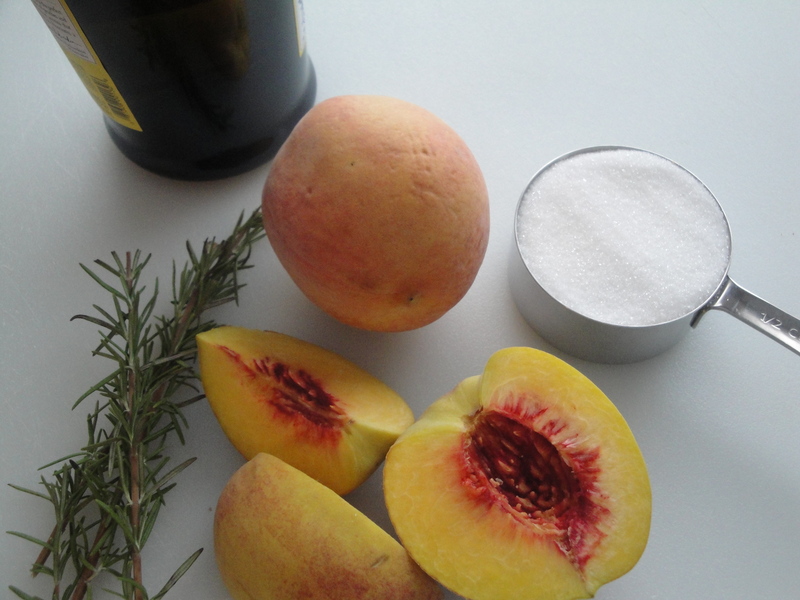 Peaches are simmered in water with sugar, blended, and strained, leaving a perfectly sweet, peachy syrup. Fresh lemon juice is added and voilà! 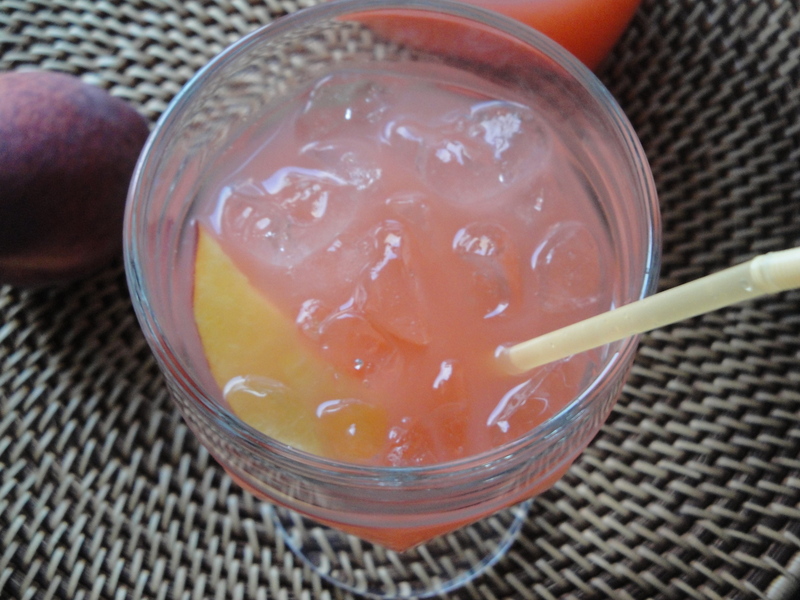 Peach Lemonade! 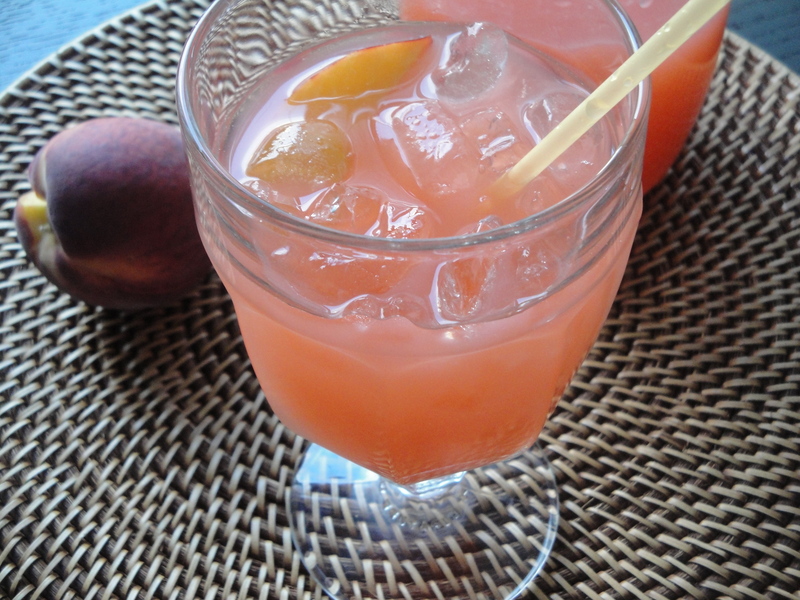 The peach flavor is subtle in this thirst-quenching drink which would be perfect on a warm summer day or spiked with a little vodka or rum. 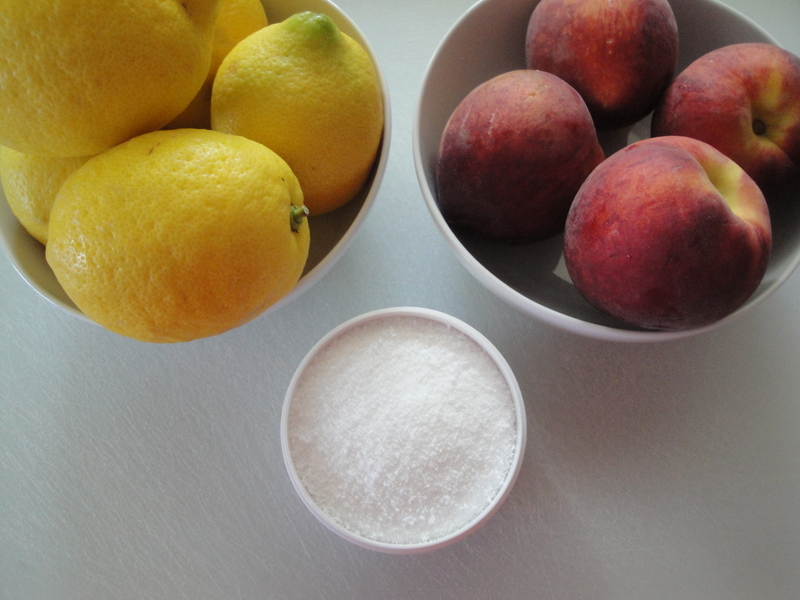 Afterall, when life gives you peaches and lemons, make peach lemonade. Sorry, I couldn’t help myself. 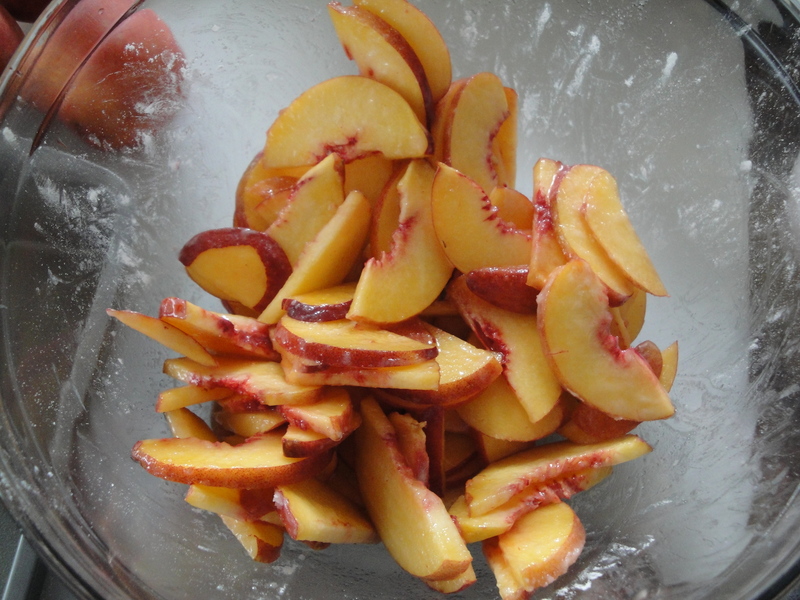 Bring water, sugar, and chopped peaches to a boil in a medium saucepan over medium-high heat. 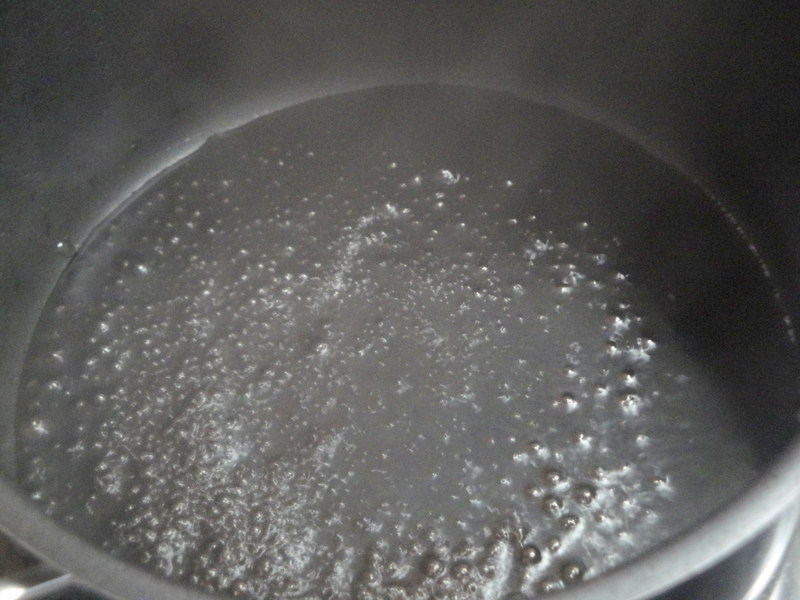 Reduce heat and simmer 3 minutes. 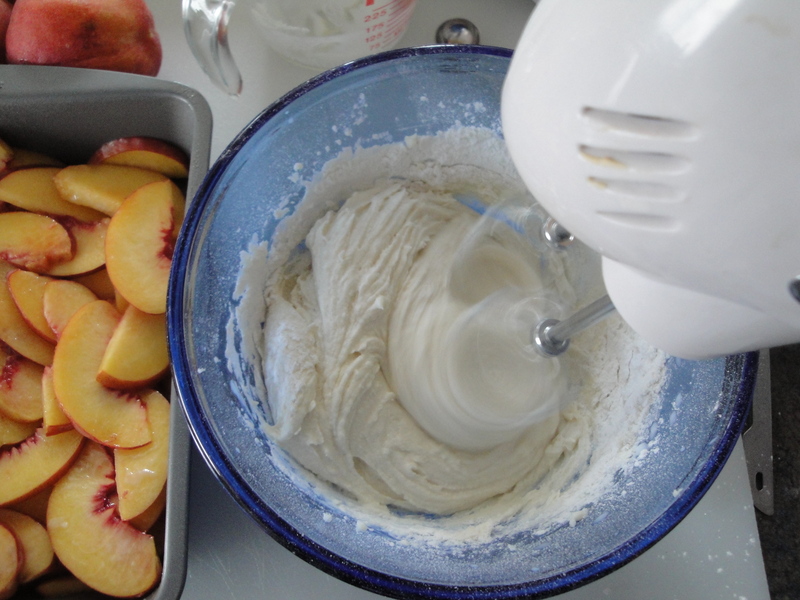 Place peach mixture in a blender and let stand for 20 minutes, allowing mixture to cool slightly. 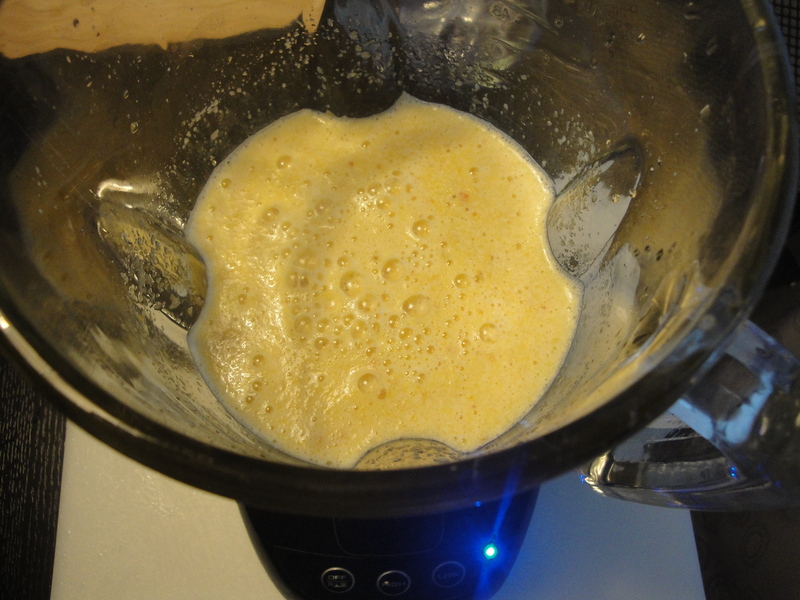 Remove center piece of blender lid and place a clean towel over the opening. 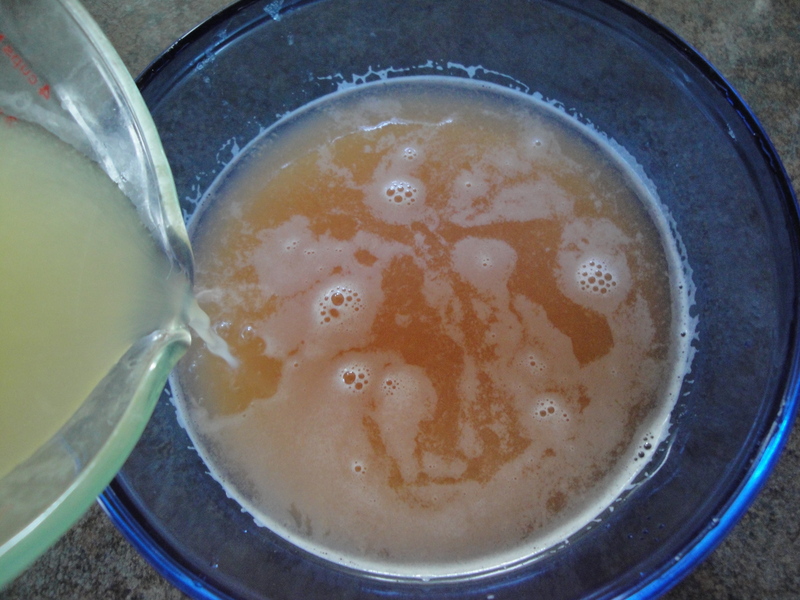 Blend until smooth and pour into a large bowl. Refrigerate for at least 3 hours. 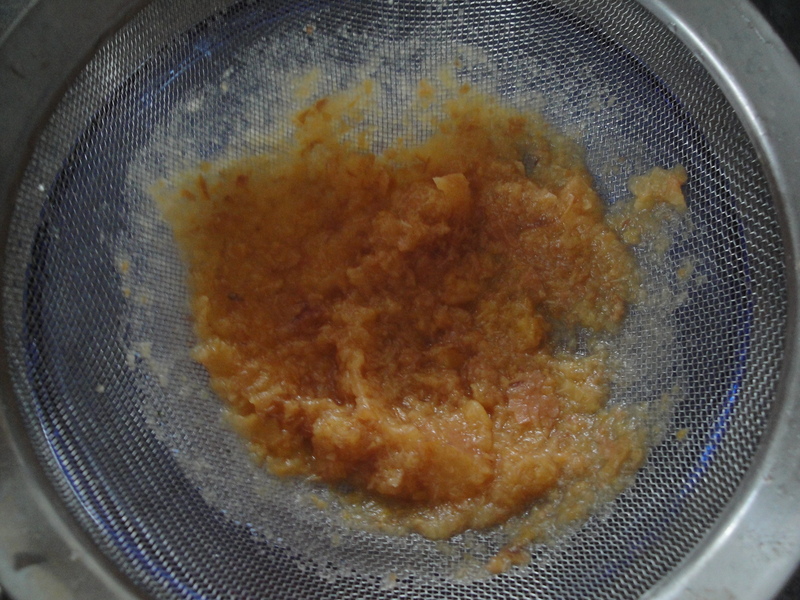 Press peach mixture through a sieve over a bowl, reserving liquid; discard solids. 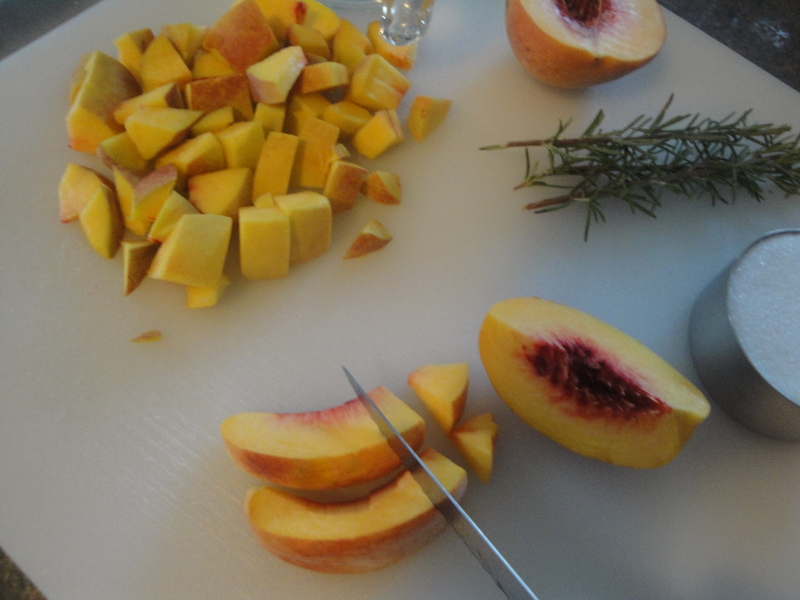 Serve over ice and garnish with a peach wedge. 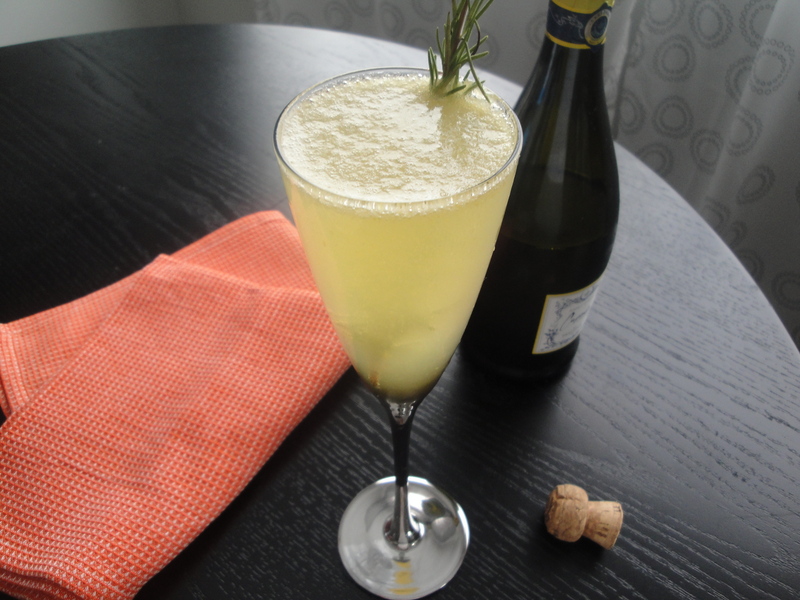 These Sparkling Rosemary-Peach Cocktails are like mimosa-bellini hybrids. The recipe calls for champagne or sparking wine so I used prosecco. 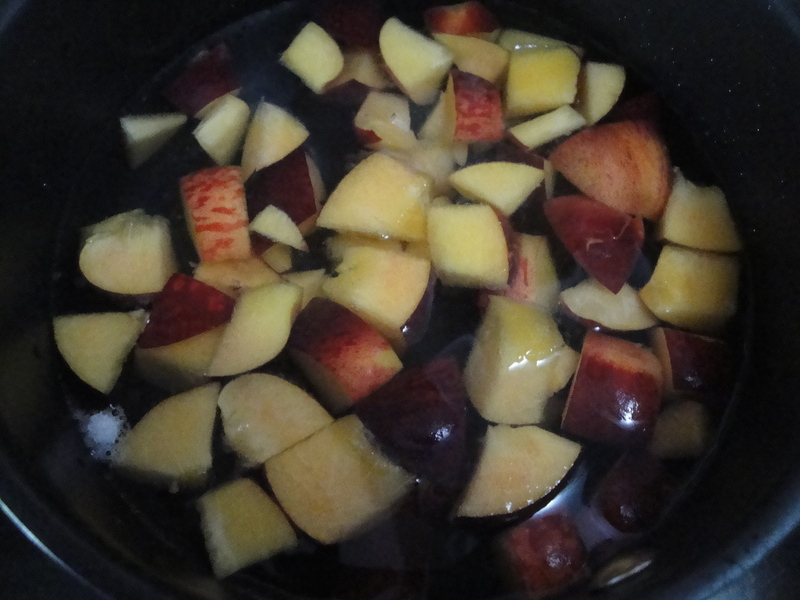 They take a while to chill (the simple syrup takes one hour and the peach syrup takes four) so if you want to make them for a brunch, consider making the syrups the night before. If you like a refreshing, sparkling cocktail but want something other than a mimosa, give this a try.